The album is barely out on the streets and we have a b-side from Interpol from their latest release Our Love to Admire. The track seems to bring out the old atmospheric Interpol of Bright Lights (think a newer Leif Erikson). Perhaps it was their move to a major label that caused this track to be nixed from the current domestic release. But thankfully, there are imports and this track is found on the Japanese version. As well as the upbeat instrumental track Mammoth (Also on The Heinrich Maneuver single). 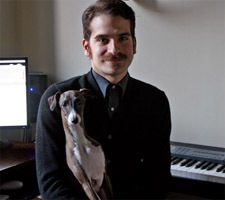 Oh and Carlos D has an Italian Greyhound. I know I have said this before but my dog is better looking. The album is def their darkest. I'm lovin it! I agree! Probably their best album yet! Although that first one was pretty darn good as well. Can't wait to see them LIVE again!